I was looking for a fun geometry problem to solve and came across the closest pair of points problem. Given a set of points, in 2D, compute the closest pair of points. The brute force algorithm takes time. There’s a better solution described at the Wikipedia page Closest pair of points problem, which takes time. As far as I know, there aren’t any posted solutions using OpenCL to compute the closest pair. So I’ve implemented one, it’s posted at closest-pair. There are a few challenges in adapting the algorithm for OpenCL. Namely, we can’t use recursion so we must convert the recursive algorithm to a procedural one. In this case it’s not to complicated because the structure of the solution is easily converted from the top-down recursive algorithm to a bottom-up parallel algorithm. There are some tricky issues when the number of points are not a power of 2. I’ve commented the code for those cases. I hope the solution is useful to someone. Enjoy reading the code, it requires careful thought. Check it out at closest-pair or view the WebCL one online at closest_pair_ocl.html. I recently read in chapter 4 of Computational Geometry by de Berg et al. the problem of computing the smallest enclosing disk for a set of points. The code is under the canvas-geolib GitHub repository in the geometry.js file, there’s also an example @ enclosingdisk.html. The example initially consists of three points and the smallest disk enclosing them. Click anywhere on the canvas and a new point will be added and the disk redrawn. I don’t want to go over the general algorithm but I do want explain computing the unique disk with three points given for its boundary. In geometry.js the function “enclosingDisk3Points” takes three points and returns the unique disk that has those points on its boundary. The below figure shows the two defining characteristics of the disk, which are (1) the disk center is centered at (x,y) and (2) the distance from the center to all three points (p0, p1, & p3) is equal i.e. the distance from the center to all three points is d.
From this computing (x,y) and d is simple. For simplicity we assume and , also we let . Solving for y, we have , using this we can solve for x, which yields Finally we also have , which finishes our computation. // return the unique disk with p1, p2, and p3 as boundary points. The project, 2dfit, solves Tangram puzzles using the Java Topology Suite (JTS). The algorithm implementation is based on what I outlined in item 3 of the post “https://bjbell.wordpress.com/2007/05/28/tangram-puzzle/“. The implementation difficulties are from using floating point arithmetic, which is not robust for geometric operations. The JTS library attempts to minimize this by a coordinate snapping technique. But for the operations used in solving Tangrams the provided snapping was not sufficient. There’s an option in JTS to specify the snapping tolerance (it has a fairly small default). I added small wrapper functions for the two operations of Boolean intersection and Boolean difference. The wrapper functions apply successively larger snapping tolerances up to a factor of epsilon, where epsilon = 1e-5. The below code shows the wrapper functions (in the code, g1 is the Tangram and g2 is a puzzle piece). Using the wrapper functions was key to a more robust implementation. The below figure shows a solved Tangram puzzle (from Test.java:FitTest_ToSingleLargeTriangle()), in the figure the puzzle pieces are labeled l1.dat, l2.dat,…, l7.dat (I was lazy in naming the files). It’s the result of running FitTest_ToSingleLargeTriange() in Test.java and plotting the result using gnuplot. I used the symmetry of each puzzle piece and a heuristic for choosing which puzzle piece to fit in reducing the number of permutations used for solving a Tangram. For the puzzle piece symmetry, I used that the square is completely symmetric so only its first line segment needs to be used when fitting it. The triangle pieces are only partially symmetric so two of their three line segments need to be tried. I used two heuristics for which pieces to try fitting, first try larger pieces before smaller ones and two skip a piece if another identical piece has already failed to be fitted (there are two identical small triangles and similarly two identical large triangles). With the above two optimizations it takes ~1min to solve a Tangram. Without the optimizations the algorithm did not complete for the Tangrams I tried. For clarity I’ve included a figure below illustrating this. In the above figure it’s obvious that the puzzle piece, , does not fit in the silhouette. One way to see this computationally is to look at the edge, , and notice that at vertex, , the next edge of the silhouette, makes a left turn with respect to the edge . This means that if the length of is less than the length of all the edges in then there is no possible way to fit in That is as long as we have the condition that one of the edges of is aligned with the edge of . The above statement provides a quick way to skip vertices of the silhouette when trying to fit the puzzle piece in the silhouette Of course before skipping the vertex the same test needs to be done on the other edge coming out of Also we note that the above test only works if the next edge coming out of makes a left turn with respect to the edge otherwise the full test for polygon intersection has to be run. Also if one of the edges of the puzzle piece has length less than or equal to the length of then the full test for polygon intersection has to be run. In summary this is a very specific heuristic that in general isn’t very useful but if you ever find yourself needing it, it can be just what the doctor ordered. 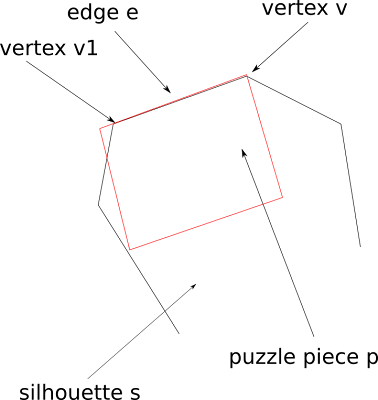 In this post I present a short summary of the paper “A Heuristic Solution to the Tangram Puzzle” by E.S. Deutsch and K. C. Hayes Jr. I’ve uploaded a scanned copy of the paper to scribd here. Uploading the scanned copy probably violates some copyright law so if they or anyone else contacts me I’ll remove the document. Ironically it’s taken me over two-years since my post here to finally read the paper. In their paper they talk about two possible approaches to solving tangrams. One is the combinatorial approach that I’ve taken and the other is the heuristic method that they describe in their paper. The heuristic method that they use is a little clever, what they do is take the outline of the tangram puzzle and then try to break it out into sub-puzzles. The following figure illustrates where two puzzles have both been separated out into sub-puzzles. 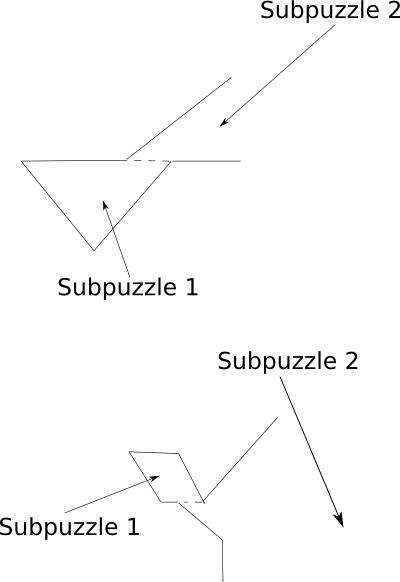 In both cases one of the sub-puzzles exactly matches a tangram piece thus allowing the algorithm to solve that sub-puzzle. The dashed lines in the figure show where the algorithm is splitting the sub-puzzles out from the original puzzle. First note that the dashed lines are called “extension lines” in the paper. They are generated to allow the extraction of the sub-puzzles. 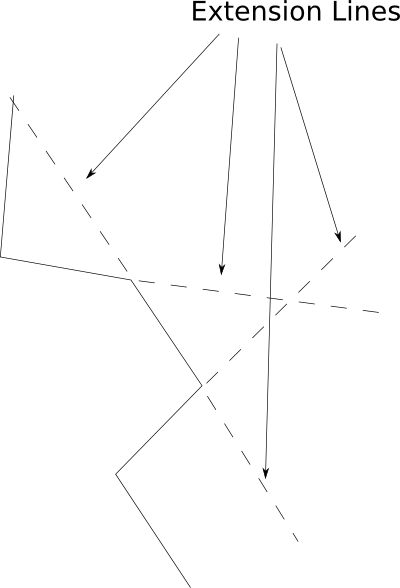 To create the extension lines the algorithm goes along the outline of the puzzle and at convex corners it generates an “extension line” that allows the possible separation of the puzzle into sub-puzzles. The following figure illustrates this. In the paper they outline various ways for eliminating extension lines that are unlikely to be of use. Once the above extension lines are created there is a set of heuristics for splitting out sub-puzzles, the heuristics are used in the following order. The algorithm attempts to locate puzzle pieces fully described by edges, rather than by extension lines or by combinations of edges and extension lines. There are an additional 8 extraction rules that are used but the above two give you their general flavor. The organization of the extraction rules is to run them recursively and at each step try to apply the most specific one possible first. If the algorithm gets to a step where there are no possible extractions it backtracks and tries another extraction rule. This process is not guaranteed to find a solution and in fact the paper gives an example of a puzzle on page 239 for which no solution is found. The paper is a niece example of where a little clever thinking and some very specific heuristics can solve tangram puzzles. Deutsch, E. S., and K. C. Hayes Jr. “A Heuristic Solution to the Tangram Puzzle”, Machine Intelligence vol. 7, 1972, p. 205–240. Our algorithm will use a standard design technique to generate what’s called an incremental algorithm. That is we compute the solution for the first points then add the point and compute the new solution using the previous solution. Output. A list containing the vertices of in clockwise order. 2. Put the points and in a list with as the first point. 7. Put the points and in a list with as the first point. 12. Remove the first and last point from to ovoid duplication of the points where the upper and lower hull meet. In my previous post on line segment intersection I introduced the two dimensional cross product as The cross product can also be used to determine if a set of three points make a right turn. First note that if then the angle between and is strictly less than For example the two vectors Similarly if then the angle between them is strictly greater than In the below image I've shown an example where the three points make a right turn. 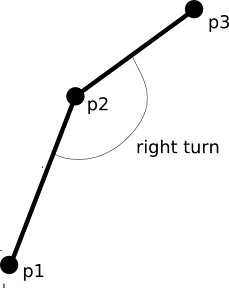 To mathematically determine if the points make a right turn we let Then taking the cross product of we have which implies that the angle between them is less than that is they make a right turn. This method for determining whether the points make a right or left turn is very useful for determining the convex hull of a set of points.